Iraq resumed oil deliveries to neighboring Jordan Saturday as the premiers of both countries met along their shared border as part of a bid to boost trade. 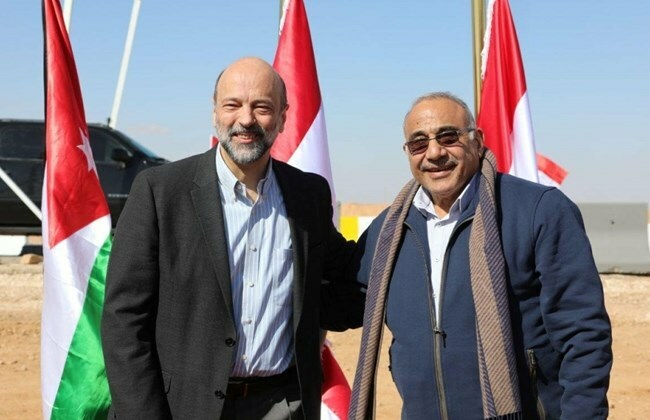 Iraqi Prime Minister Adel Abdel-Mahdi met with his Jordanian counterpart Omar al-Razzaz at the Treibil border crossing, referred to as Al-Karameh in Jordan, which reopened in August 2017. The only crossing between the two countries was shuttered in 2014 as Daesh (ISIS) swept across Iraq, but was reopened after Iraqi forces pushed back the militants. Baghdad declared victory against Daesh in late 2017. On Saturday, the two sides agreed that Iraq would provide Jordan with 10,000 barrels of crude a day transported by truck from oil-rich Kirkuk province, Jordan’s official Petra news agency said. Transport costs would be taken into account under the deal, according to Petra, and the possibility of Baghdad granting discounts to Amman has upset some Iraqis. Amman is pushing to meet its hydrocarbon needs through a pipeline project that would connect Basra on the southern tip of Iraq with the Jordanian port of Aqaba. The two countries said Saturday they had begun studying its construction. In January, Jordanian King Abdullah II made his second trip to Baghdad in more than a decade after a flurry of meetings between senior officials of both countries. For its part, Iraq is looking for solutions to its chronic electricity shortages. To secure an exemption from U.S. sanctions on Iran, Baghdad has announced plans to curb its reliance on electricity supplied by Tehran and buy power from Jordan, Turkey and Kuwait. The two premiers agreed Saturday that Jordan would begin providing electricity to Iraq “in less than two years”, according to Petra. The two sides also agreed to lift Iraqi taxes on hundreds of Jordanian products, and to establish a joint industrial zone along the border, according to statement issued by the prime minister’s office.